We decided on a train theme-and when she saw this fabric on my sewing room floor, decided these colors (teal, brown, and green), would be so cute. I think it all came together really well! let’s have a look see, shall we? Phew! This thing was fun to make and only took about 2 hours, but still…I think I made the biggest mess my kitchen has ever seen making this cake. And that’s saying something. It’s a chocolate cake with buttercream frosting (not going to link to the recipe because I didn’t like it much) and is covered in homemade marshmallow fondant. 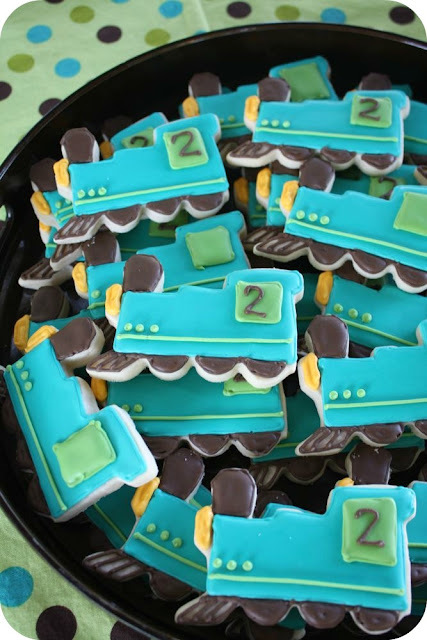 I used the train cookie cutter I cut my cookies with for the engine, then cut out the other cars and decorated them with pieces of green fondant. The wheels I cut out with a piping tip-it was the perfect size! You can see the coal car and caboose here-the caboose I just cut off some of the engine parts, and the coal is just little nuggets of fondant. I made these sugar cookies -not much to say there besides the fact that they were really fun to make-I especially love the little 2 in the windows of some of them! 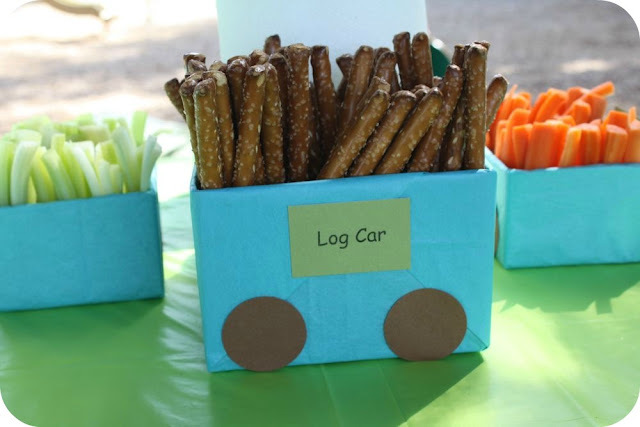 …log car! Clever huh? We found the idea here. 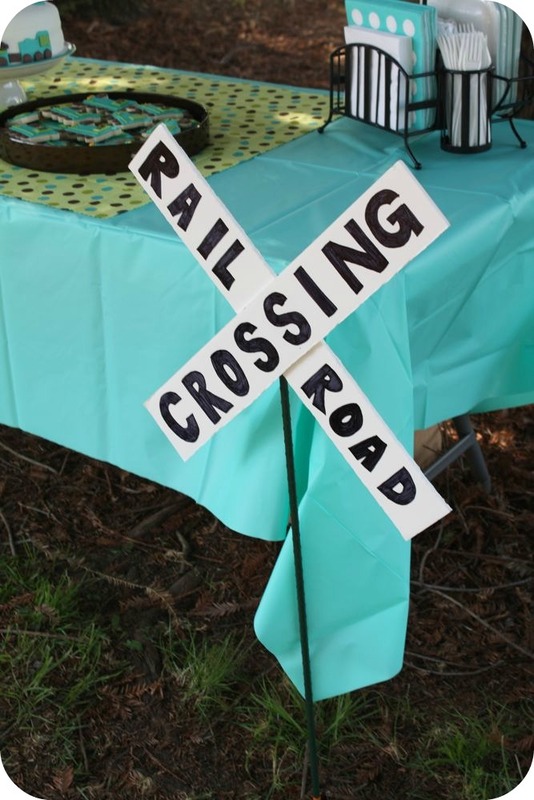 We also made two of these railroad crossing signs which turned out so cute! She also brought a blanket and her train sets from home for any interested kiddos. 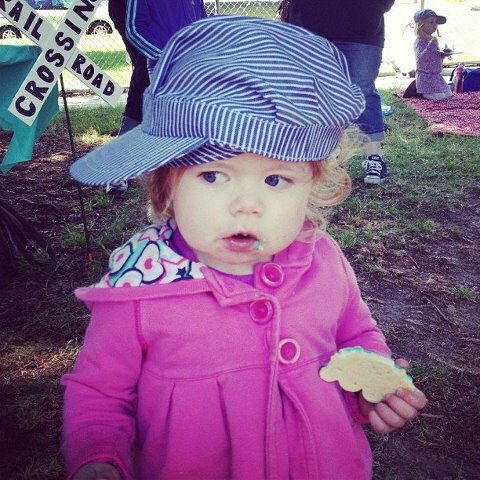 For the favors she bought some wooden train whistles and conductor hats for the kids. 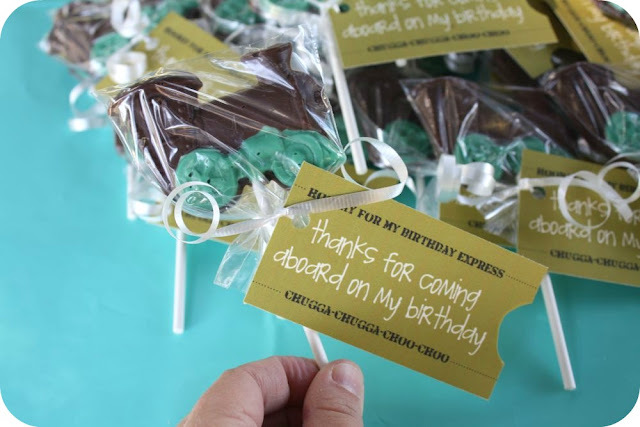 I also made these little train pops for the kids to take home as favors-she added these tags which are free to download here. They were the perfect color! Charlotte wore her hat the way all the cool kids do…sideways. Seriously, she did that herself. Oh my!, it is so cute!!!! I am definitely bookmarking this post!!!!!! Well done!!!!! Wow! 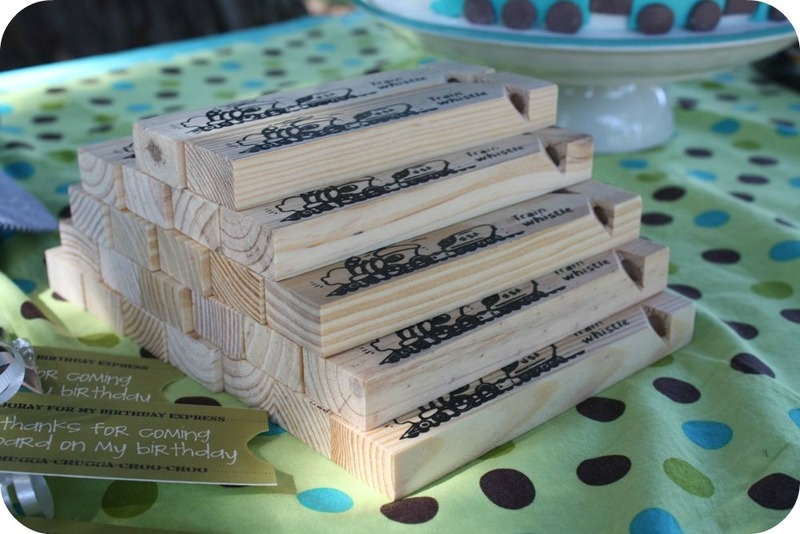 Love the cake and the biscuits and the favours.. Olala!! Love the cake and de the biscuits. I lovely. Ha ha what a fun looking party! I love the colour scheme. Very cool! So cute and I love the colors. I love this. 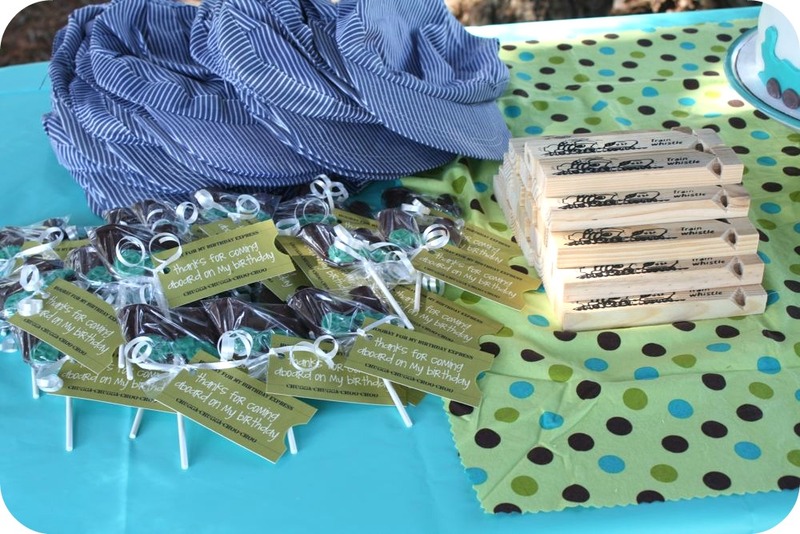 The favors are genius, too–not just a bunch of junk to clutter up the house! 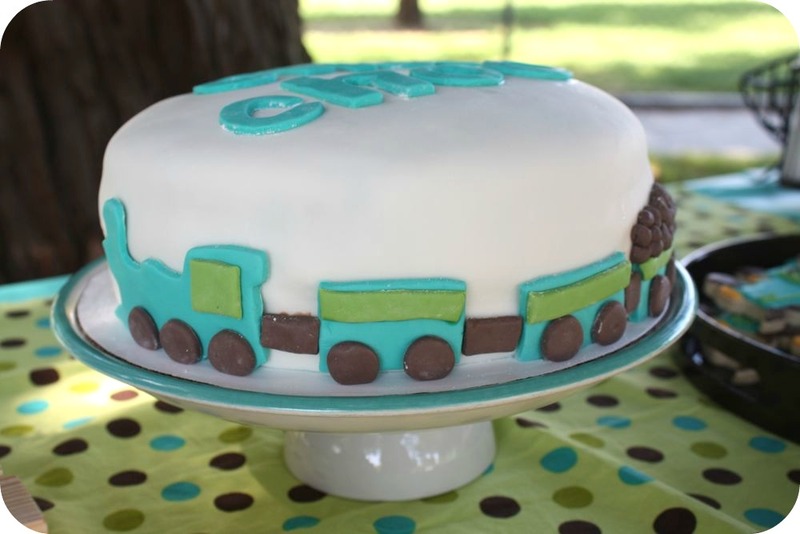 That cake is so amazingly done, it seriously takes the cake! lol Great job again! You continue to out-do yourself every time, I think your party posts are my fave! Darling! I love the theme and all the special touches. 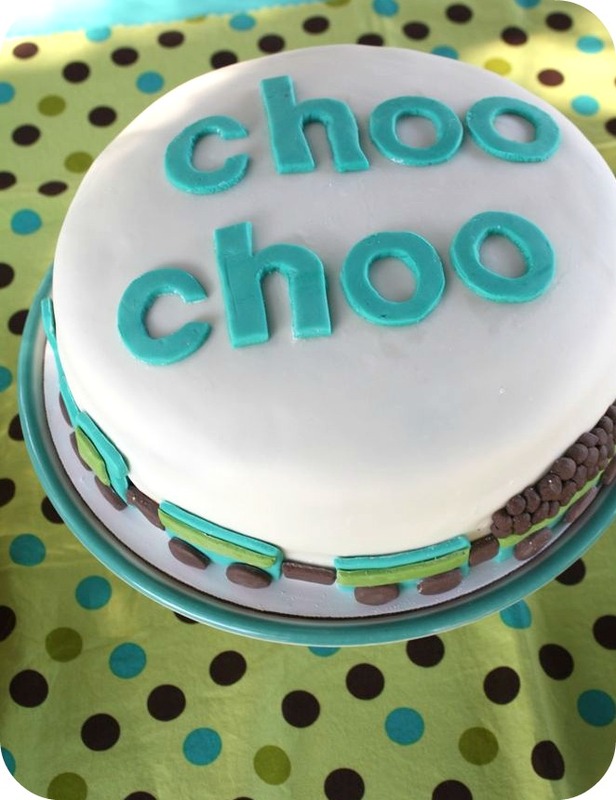 Is the fondant recipe something you can post? I was trying to find a good recipe last month for a cake I was making, but being unfamiliar with fondant and most recipes have unique ingredients I did not have on hand I opted for the Wilton Buttercream recipe (which was yummy but I would like to try fondant someday). What a fun party! 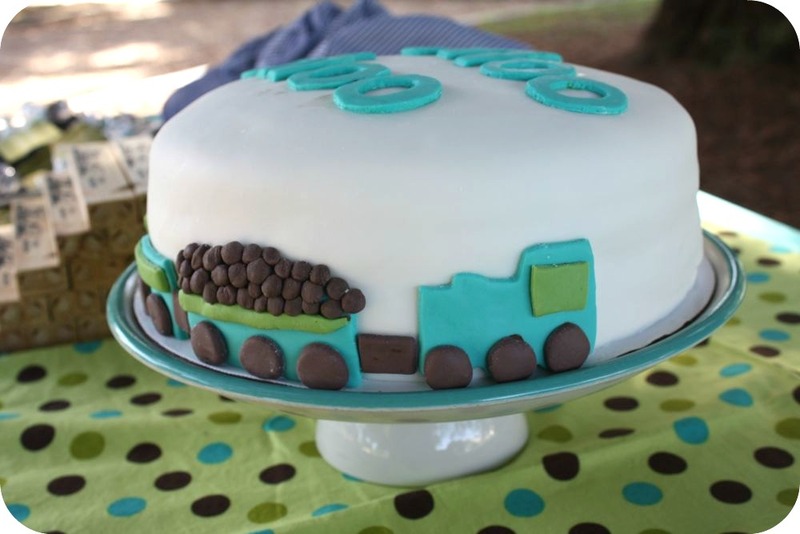 The cake is awesome! And I like Charlotte’s coat. 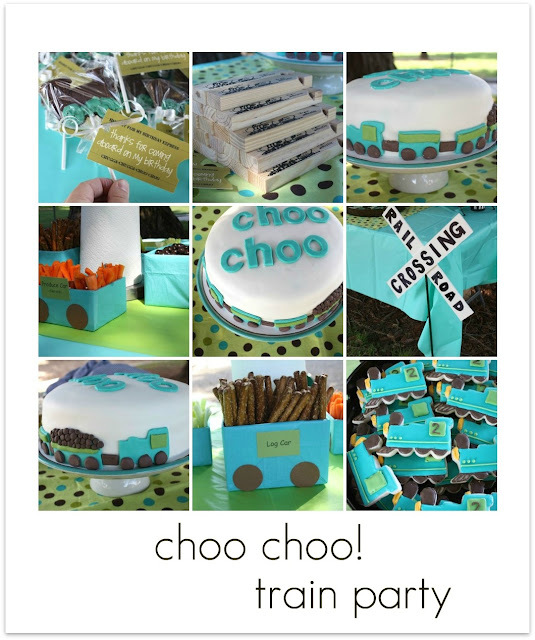 Thanks for posting this just in time for my 2 year old’s train birthday party next week! 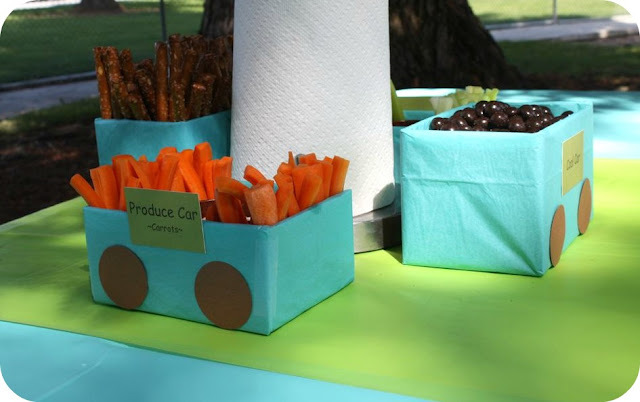 You did an amazing job – and I love the snack car and the favors! This is too cute, and you are way too creative. Wished you lived closer and could plan my kids parties. Amazing party! You always have the most outstanding little touches. I just love the photo of Charlotte at the end… cracking me up! What a cutie. oh my goodness. too cute. theses things our kids remember. I did something similar, when our son turned 5, he was really into dinosaurs. so a big dino prty it was. he is 28 now and still remembers it. What a great party! You are an inspiration! Love the train pops! How did you make them?